CBSE Class 2 English : Takshila Learning offers well planned, structured online content for CBSE Class 2 basis the school curriculum. The content is carefully designed to give the students in-depth knowledge so as to help and develop their communicative competence. We offer a complete package that includes Class 2 English, Hindi, Maths, EVS, GK and Computer animated video lectures, activities, quizzes, flash cards, NCERT solutions, and worksheets with performance analysis. In 2nd Class English, Sentences are introduced. A sentence is a group of words that makes a complete sense. A sentence always begins with a capital letter and ends with a full stop. Class 2nd children need to practice to understand who to make sentences. Example: big is city Delhi is…….is it making any sense? No, so we arrange these words in their proper order to make complete sense. The mouse is under the chair. So, here is a worksheet for kids. Let them practice. Arrange the following group of words to make complete sense. 1. Flower beautiful a rose the is. 2. Dog an pet is animal. 3. Dancing peacock the is. 5. Anya friend best my is. 6. Doing Sohan homework is his. 8. Doctor medicine us gives the. 9. National Lion animal is the. 10. The sky in fly aeroplanes. Rewrite the following sentences using two rules of the sentence (Capital Letter and full stop). Match the beginnings with the endings to make complete sentences. 1. Delhi is seven days. 2. The Taj Mahal capital of India. 3. Vidhi Is gives us milk. 4. A week has in the sky. 5. An Aeroplane singing a song. Watch animated videos for visual learning, Click CBSE Class 2 video classes. 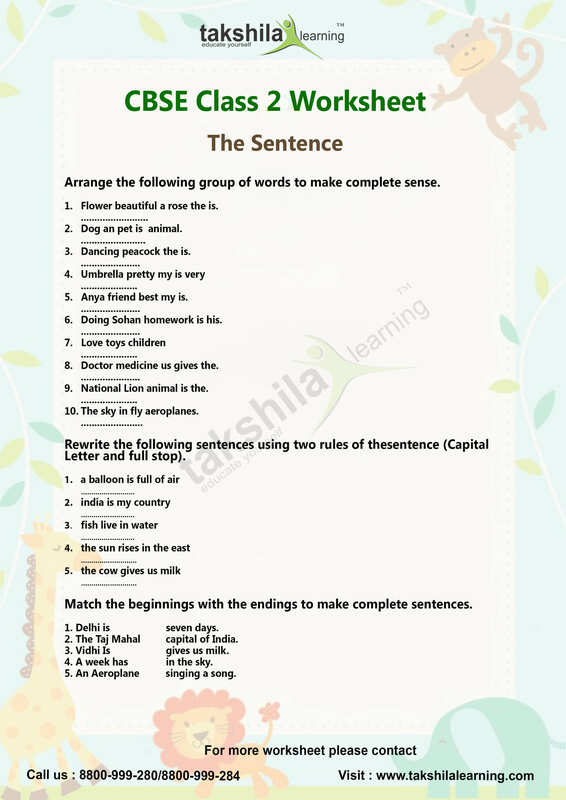 For more quizzes, worksheets on different topics, different subjects, different classes, kindly visit www.takshilalearning.com.